Harold tells Sky that David & his family are coming to stay. MAX: You've got cancer. Steph nods. Max kisses her hand. STEPH: It's in my left breast. Today's my first day of chemotherapy. MAX: And you've known for some time…since before we broke up. STEPH: I couldn't tell you Max. You'd already been through so much with Claire, I couldn't put the you and the kids through it again. So I just figured if I could make you not love me anymore, it wouldn't hurt so much. MAX: Oh, Steph, I never stopped loving you and I never will. Jack is pulling faces to make Oscar laugh. He goes to answer at knock at the door and it's Nina. Jack says he wasn't expecting her so soon and Nina tells him she got off the plane and came straight over. She tells him the tour was a sell out and he says that he missed her and it was good they had some time apart. He had time to think about what was important and he tells her he realized she is important to him. Jack asks her if they can start again, a clean slate? Nina says yes but if they are there is something she has to tell him first. STEPH: There's always gonna be a chance the cancer could come back. MAX: Steph, you're young and you're strong. You can beat anything. STEPH: What if I lose the fight? How can you just stand there and watch someone die right in front of you? MAX: Steph, you're not just someone. You're the woman I love. STEPH: Well you might be strong enough to watch me die, but what about Summer and Boyd? They've already gone through this once with their own mum, Max. I know how badly it effected them, I spoke to them about it. You said so yourself. So what, now you'll just willingly expose them to that sort of pain? Lyn and Joe walk in. LYN: Oh! Max, what are you doing here? MAX: I saw you guys downstairs and I followed you up. Steph's told me everything. JOE: Right…fine…well you can leave now mate, this is family only. MAX: Joe, I don't want to make trouble, okay? I just want to be here for Steph. STEPH: Dad, it's alright. I want you to go please Max. Just go and think about what I've said. MAX: I'll be in touch... Soon! STEPH: I mean it, Max. There's a lot more to work through than you realise. Jack is yelling at Nina about her kiss with Robbie D. He told her he knew it would happen. Nina says it was just one kiss and nothing more and she knows it was wrong. Jack asks how is he supposed to trust her now. Nina leaves. Harold is telling Lou about David & his family coming to stay with him. David & his wife will stay in the guestroom and Serena will stay with Sky. Lou asks him if he wants a hand to make up the beds but Harold tells him he's fine, Sky said she'd help. Harold goes to make some coffee. Lou answers a knock at the door. There's a delivery guy looking for Mr Bishop, he here to deliver his new BMW. Max tells Summer and Boyd to go to the coffee shop to get some dessert. Izzy tells them to put it on her tab. When the kids leave Izzy tells Max she knows something's wrong. Max tells her nothing is wrong, he just saw Steph at the hospital today. Max tells Izzy that Steph has breast cancer. Izzy says there is no way that girls their age get breast cancer. Max tell her she's known for 5 weeks and today was her first day of chemo. Max tells her Steph did it to protect him and Summer and Boyd. IZZY: Yeah, well I understand her wanting to protect the kids but keeping you in the dark, I don't know… doesn't it seem a little bit immature. MAX: She just didn't want to be a burden, that's all. IZZY: No, I'm sure she did it for all the right reasons. I just don't think it says that much about your relationship. MAX: Izzy, can you just give me some backup. IZZY: Look, if she really trusted you she would of given you the chance to support her but she didn't. MAX: You don't know the first thing about me and Steph. The important things is I've found out what she's been going through and I intend to make up for lost time. IZZY: What about the kids? How much are you going to tell them? IZZY: I don't think you should tell them anything. You know how much it hurt them when Claire died. Look I know it's hard but perhaps it might be better if you respect Steph's wishes and stay out of her life, for the kids sake. Harold is looking over the new BMW saying you'd need a Uni. degree to drive it. Lou comes over telling Harold he's moving into the pub and was just getting a few more things from home. 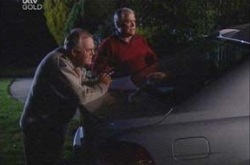 Lou tells Harold they should teak it for a test drive to make sure David hasn't brought to lemon. Harold says he will never be seen dead in that thing. Jack is trying to get Oscar to sleep when Lyn, Joe & Steph come home. Steph says she still feels quite ill and the medication mustn't have kicked in yet. Joe offers to make her a herbal tea. Joe and Jack go into the kitchen. Lyn asks Steph about Max. LYN: Stephy, What was going on with you and Max when we came in? STEPH: Oh, he was just telling me how much he loved me, and he offers his full support. LYN: What do you think about that? STEPH: I wanted to throw myself into his arms. I didn't of course. LYN: Why not? You still love him. STEPH: Yeah, I know I do. I just, can't. Not after the way I've treated him. All these lies, all that secrecy. Then there's Summer and Boyd. Why's life so complicated, mum? LYN: Sweetheart. You know that whatever happens, we're here for you? STEPH: I know. You think I should let him back in my life, don't you? LYN: It's not my decision love. STEPH: Well, it's Max's decision only where we go from here. I'll accept whatever he wants. Summer and Boyd go off to bed. Izzy asks Max if he's going to do the sensible thing and not tell them as it will create too many problems. Max says he can't make up his mind but Izzy was condemning Steph for not being honest and giving him a chance to support her and now Izzy wants Max to do the same thing with the kids. Izzy says it's different. Max tells her it's been three years since Claire died and the kids are more mature now and he knows Summer loves Steph and she will want to be here for her. Izzy says she knows they love her but what if the worst happens. Max tells Izzy he's not going to left it happen. Izzy tells Max he's not God and this is going to affect the whole family. Jack apologies to Nina for the way he acted yesterday. He says he should have been grateful that she was honest with him and asks Nina if she forgives him. Nina says she does and she gets jealous too, remember Edwina. Jack asks if they are back together. Nina says yes and now she can tells him that she has a surprise for him. She tells Jack to meet her a Lassiter's foyer after school. Max is telling the kids about Steph, Izzy is listening. MAX: That's why she left us. That's why she kept pushing us away. I know it's a shock. I nearly didn't tell you, but I know you're mature enough to handle it. I understand if you might be angry at Steph, but she did have our best interests at heart. And I love her. I want to do whatever it takes to get her through this. Whatever is takes to help her out. I understand if you don't feel the same way. SUMMER: I want to help make Steph better. Summer is crying, she hugs Max. BOYD: Thanks for telling us, dad. MAX: You don't have to say anything yet. BOYD: No, I'm with Summer. Of course we've got to support Steph. Harold is backing out the new BMW. Lou comes over and scares Harold. Lou gets in the car and asks Harold to take him for a test drive. Harold says no, he was just backing it out so he could get his own car out. Lou pleads with him and Harold gives in saying once around the block and he's going to drive slow. Jack and Nina walk into the room. Jack says it's amazing. Nina tells him Melody is paying for the room for one night because the tour went so well. Nina says it's also a thank you for him. Jack tells her everyone makes mistakes. They kiss. Max comes over and he takes Steph by the arm and tries to kiss her, but she pulls away. MAX: Okay, I did everything you suggested. yeah I thought about what you said. MAX: I told the kids about it this morning. They know the lot. The cancer, the treatment, why you left us. STEPH: They must hate me. MAX: No, no, no. They were upset, for you. And they want to help. They offered to. STEPH: It's so much more than I deserve. So where does this leave us? MAX: I told you yesterday! I'm going be with you every step of the way. STEPH: But I was so awful to you, Max. I don't understand. MAX: Steph, I love you. It's just as simple as that. They hug and they are both crying. Boyd is sitting at the counter looking sad. Izzy asks him to come into the kitchen. Boyd tell her he can't take it all in and he fells sorry for Steph but he can't understand why she treated them the way she did. He asks Izzy if didn't trust them or just didn't care. Izzy tells him only Steph can answer that. 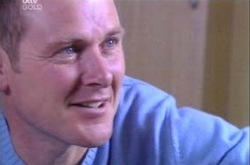 Boyd asks Izzy what will happen if the worst happens. He tells her Summer and Max won't be able to cope. He asks Izzy if she thinks Steph will beat it. Izzy says yea and they just have to be there for each other. Nina is in the bedroom getting ready. There are candle's lit. She comes out of the room and takes Jacks hand and leads him into the bedroom. Jack shuts the door behind them and they start kissing.